Today’s customer is accustomed to visiting beautiful eCommerce stores. The consumer today has better knowledge and multiple avenues to find information about latest technology, new phones, and latest tablets. Attracting this customer and breaking through the clutter is now increasingly difficult. This theme roundup will give you some of the top phone repair shop themes that can help you break through the clutter and design beautiful stores to attract this customer. All these phone repair shop themes themes require a self-hosted WordPress site. 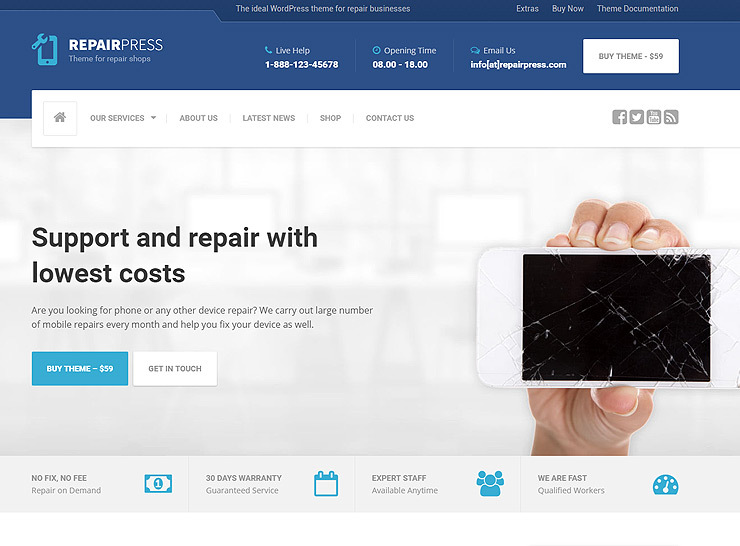 RepairPress is a phone repair industry-specific theme for WordPress. It has a clutter-free, minimalist design geared towards marketing and tech product repair. The theme is responsive, supports high-resolution imagery and is compatible with most modern browsers. This theme works great with top visual page builders like SiteOrigin and Visual Composer. It is compatible with popular plugins including WooCommerce, Contact Form 7, LightBox, Custom Sidebars, WP Rocket and Advance Custom Fields. It has some key demo options that you can import with the one-click installer. RepairPress also packs key page layouts to choose from such as homepage, contact page, shop, about page and services page. This is a great theme for phone repair, laptop, computer, tablet and camera repair shops. It is ideally a theme that any novice user can utilize to create their phone repair services storefront. 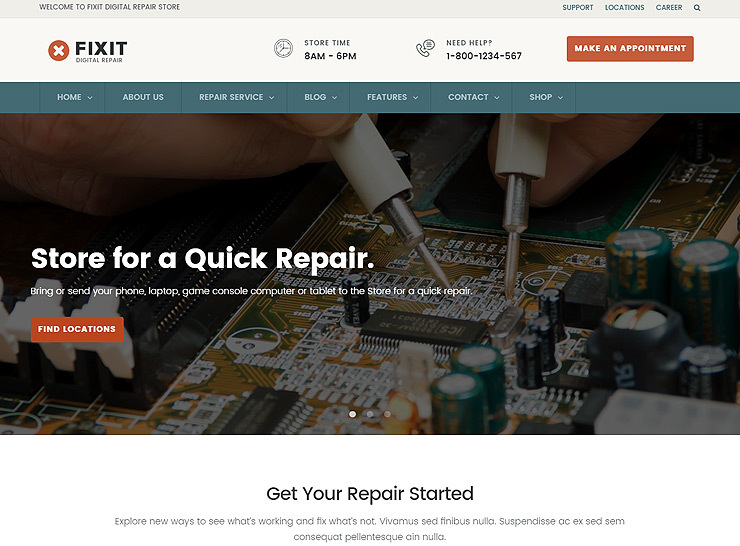 Fixit is a powerful design option as a phone repair shop theme. It covers more than just the basics for a storefront that can deal with all sort of tech product repairs. Fixit comes with some great plugin compatibility, ideal to run an eCommerce site with the theme. This theme is compatible with WooCommerce, MailChimp, Contact Form 7 and KingComposer. The theme is a great design and eCommerce option when combined with these plugins. It offers 3 homepage options, one-click demo installations, advance theme options, 3 header options, unlimited color options and 3 blog styling options. Advance theme options include multiple page designs, map integration, Google Fonts, shortcodes, widgets and more. Fixit is a great option as a phone repair theme that works well with some key plugins to build a superb storefront. It covers design and configuration options with key advance theme features as well. We readily recommend this theme to both savvy as well as novice users. 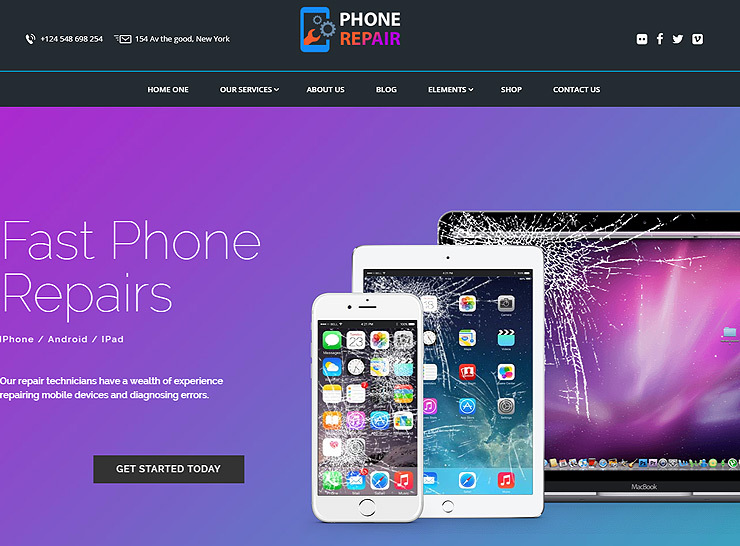 PhoneRepair is a great theme option ideal for a storefront that offers repair of phones, cameras, tablets, computers, laptops, or other technology devices. 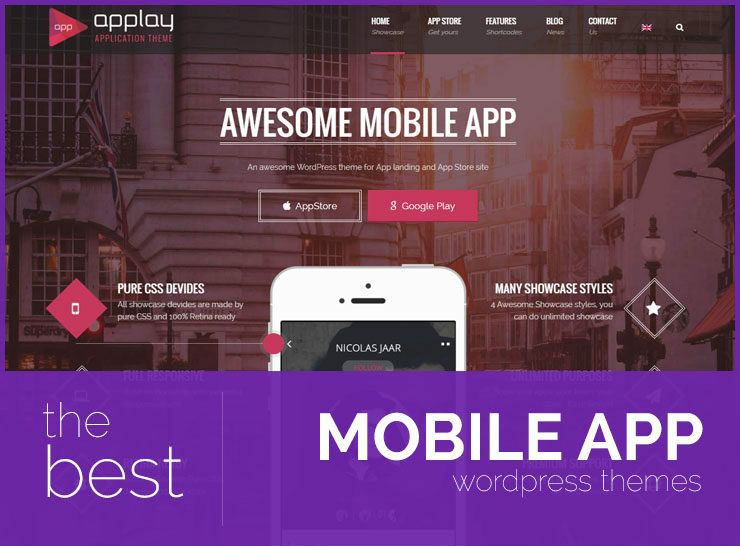 This phone repair shop theme covers key essentials like support with popular plugins and helpful demo content. This theme is compatible with WooCommerce and Visual Composer. It includes several design options like 7 footer styles, 5 header styles, several homepage, and other page design options. PhoneRepair has font, size and color change options for headings, navigation, header and main text. It covers all the basic features that a phone repair storefront would need. This theme is ideal for the novice user and covers all the basic features. Demo content comes preloaded and can be used to design the site swiftly. 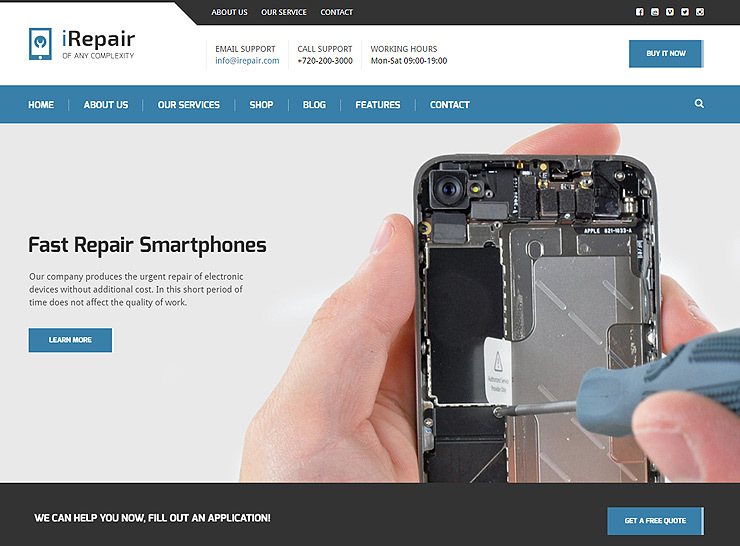 iRepair is a key theme designed specifically for phone repair and gadget repair shops. For the savvy user, it offers excellent features and flexibility. It is compatible with some popular plugins making it fun and flexible to use. iRepair is compatible with WooCommerce, Slider Revolution, and Visual Composer. This theme is highly flexible with the use of these plugins. 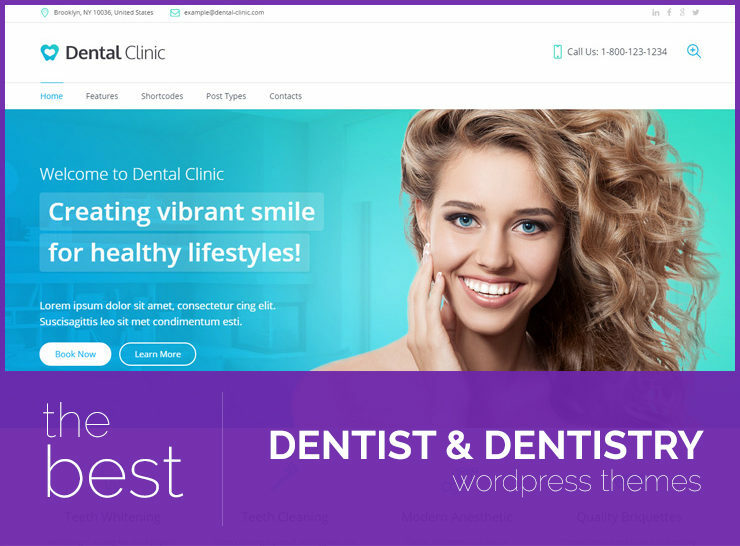 It features 3 homepage design options, 3 service page design options, 2 blog variants, a child theme, font icons and one-click demo installers. The theme is highly flexible and provides great features for a phone repair shop. A savvy WordPress user would find this theme fun to use. It is also a great choice for a novice user who wants flexibility, ease of use and quick design features. 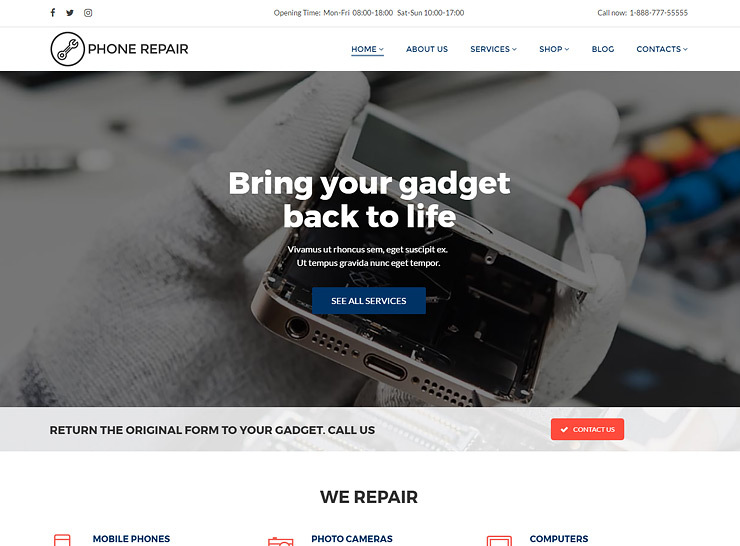 Naples is a flexible phone repair shop theme for WordPress but works well for any gadget repair shop. This theme offers prebuilt theme options with one-click demo installation. This allows for quick and easy site design without having to spend too much time. This theme is packed with features including 3 homepage options, 19+ other page design options, custom categories for phone repair, and parallax effect for the homepage. It is compatible with most popular plugins like WooCommerce, Visual Composer, Slider Revolution and Contact Form 7. PSD files for design can be purchased with additional cost. It is a responsive, translation-ready, and retina-ready theme, ready for installation and running. We recommend this theme to the novice user who wants to design their storefront quickly and easily. It has several other features like Google Font compatibility and detailed video guides, making it a great novice choice. The Repair is a great phone repair shop theme designed with the niche in mind. This theme is ideal for a professional design presence and a device repair storefront. The theme covers several design options such as 7 header options, 300+ design icons, one-click demo installation, unlimited colors, unlimited sidebar design options, 100+ content block options, and more. It is also compatible with essential plugins like WooCommerce, Visual Composer and Slider Revolution. This theme is responsive, covers 600+ Google Fonts, and is translation-ready. The Repair is an ideal theme to use in the phone repair niche. It packs powerful features with great flexibility and allows several design options. This theme has built the cost of all the premium plugins mentioned, in its price. 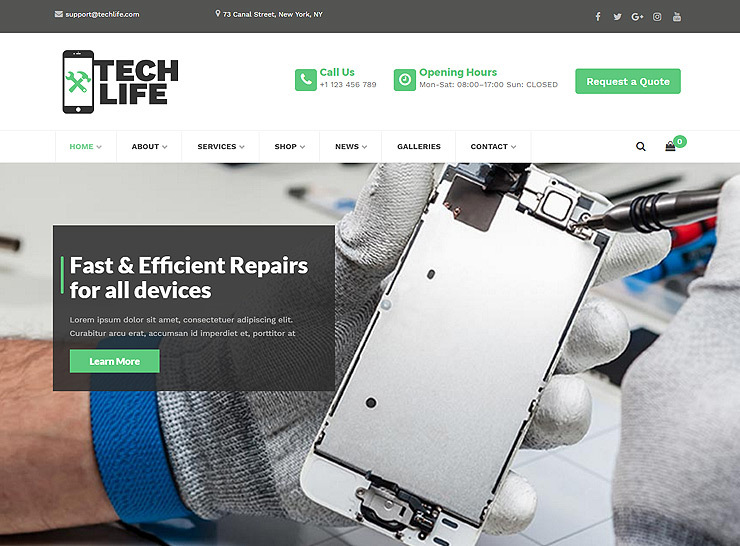 TechLife is another flexible and easy to use WordPress theme for phone repair shops, electronics, and other gadget repair. The theme is designed on Bootstrap 3 and is responsive and retina-ready as well. TechLife comes paired with Visual Composer and Slider Revolution. It works well with other popular plugins too like WooCommerce and Contact Form 7. Other features include Google Map integration, custom tech icons, unlimited color scheme options, mega menus, and unlimited sidebar options. TechLife has some custom post types for the storefront like testimonials, services, team members, and brands. This gives the user option to design several eCommerce related elements on their site. The theme has one-click demos, sample content, and a child theme too. Overall, this theme is one of the top phone repair shop themes available in the market. It covers the basics and then packs a punch with tons of advance features and sample content – highly recommended. 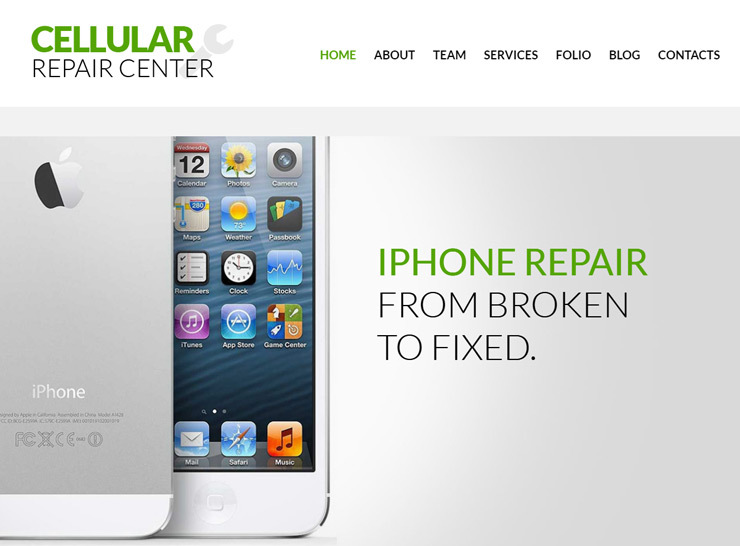 Cellular Repair Center is a highly customizable and flexible phone repair shop theme. It pairs well with some popular plugins and offers flexibility through several custom features like its drag-and-drop page editor. This theme comes with 25+ content design module options, a custom built but powerful page builder, detailed set of advance customization options, and several content layout options. Content design options such as price lists, services, contact forms, call to action buttons, and sliders are available to build a strong storefront. This theme is built on Cherry Framework making it robust but flexible to use. On top of that, the theme offers multiple widgets and customization options. 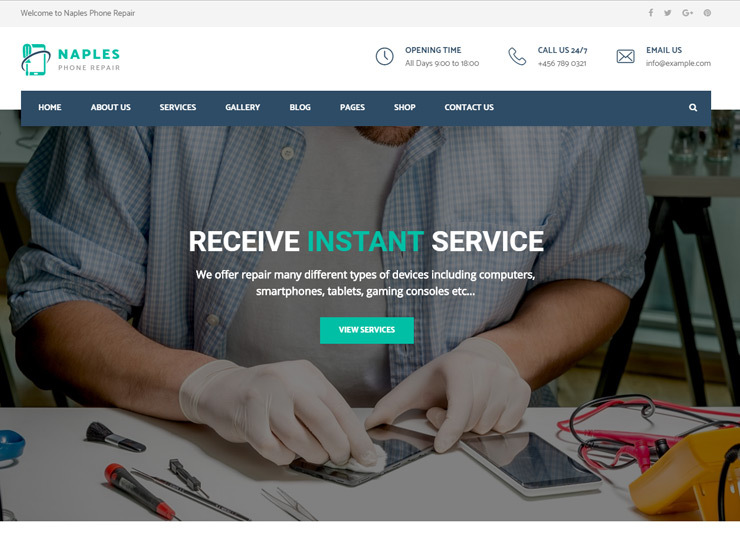 We highly recommend this theme as a storefront and service portfolio for phone repair shop. It is powerful, yet flexible, and has numerous configuration options, perfect for an eCommerce setup. Technico is a well-rounded WordPress theme that offers a wide range of features for several industries and niches. It works great as a phone repair shop theme because it is easily configurable and highly flexible. 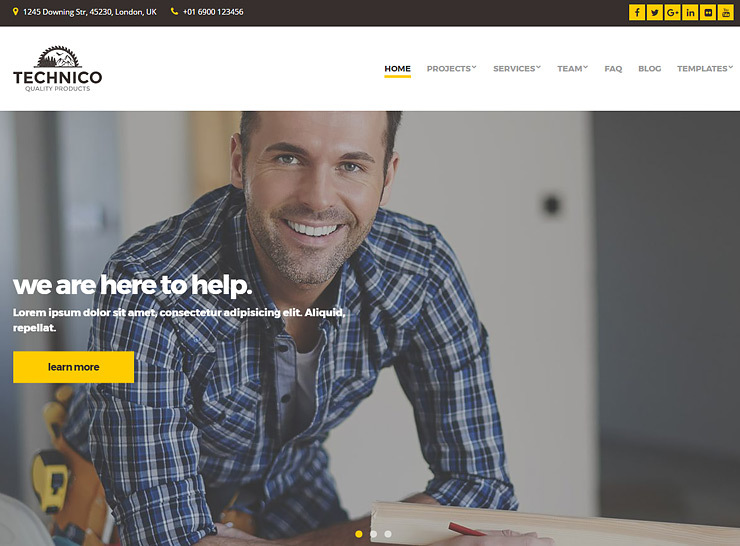 Technico works great with several page builder options including SiteOrigin, Divi Builder and Elementor. It includes several design options like 5 blog post options, 30+ color options for all pages, 100+ customizer options and 12 different custom widgets. The theme is responsive, translation ready, and retina-friendly as well. This theme is power-packed with robust features. It comes with sound integration with several plugins and page builders. You can’t go wrong with this theme if you are a savvy WordPress user. You can easily modify page and content elements to run your phone repair shop in a matter of minutes. RepairWP is a well-rounded repair shop theme that covers a wide niche. 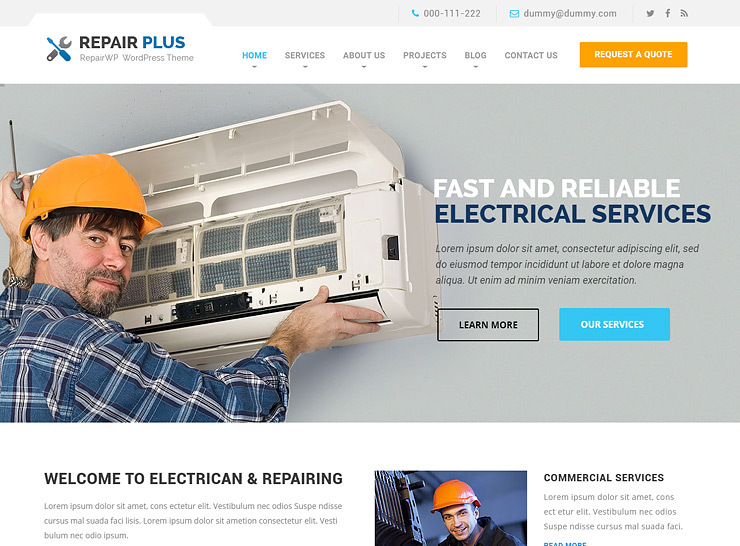 This theme is useful for electricians, plumbers, electronics, and tech gadget repair. It works great as a phone repair shop theme as well. RepairWP pairs really well with top plugins such as WooCommerce, Visual Composer, Contact Form 7, and Slider Revolution. The theme also offers flexibility in design through the click-and-install demos and PSD files. It includes beautiful designs options for the homepage, several customization options for colors, headers, footer, and sidebar, and has a demo trial version available for a test run. It is the perfect theme for a novice user who can run the trial to see how the theme functions. The novice user would also find the theme friendly in configuration and easy to use. Having a website is extremely important for mobile apps and software developers. Along with the fact that a website is crucial for marketing and advertising, potential customers and users can learn more about the mobile app, interact with you and provide feedback. Here is a list of some of the best themes for mobile apps and software showcases that can help you build a unique website for your app or product.